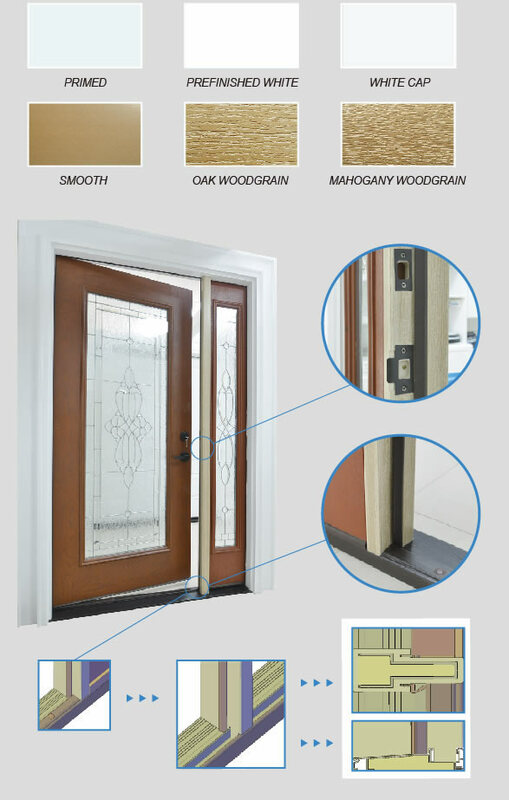 The 4Ever Frame is an innovative, new alternative to traditional wood door jambs. After extensive research and development, Worldwide Door Components has formulated a poly-fiber Door Frame System that combines all the strength and stability of wood without the rotting, warping and splitting. The 4Ever Frame is resistant to mold, mildew, fungus, salt, chemicals, insects and pollutants. The 4Ever Frame System is the long-lasting alternative to a maintenance free entryway. This unique formulation means that the 4Ever Frame can be machined the same way traditional wood jambs are but with no added hassles! The 4Ever Frame will maintain its integrity for years to come. When compared to wood frames, the 4Ever Frame can be painted and nailed, easily machined, provide the same use and functionality and has the same shape and design as a wood moulding products solid material. 4Ever Frame is the best high-performance trim product on the market. Available in raw/primed/woodgrain oak/woodgrain/mahogany woodgrain/white cap, to add elegant details in a variety of applications. While 4Ever Frame readily accepts paints and stains, it comes in a crisp semi-matte white finish, its profile is white throughout, and it's protected with UV inhibitors, making it resistant to fading or yellowing over time. With sealed edges on all four sides, 4Ever Frame is easier to clean. With materials that are easily milled, shaped, and moulded using only standard woodworking tools, 4Ever Frame can be routed and cut without chip outs. Our fastened closed edges have no splits, and can be heat formed for curved applications. They're also easy to install saving time and labor costs! Frame products provide a uniform aesthetic. Boards offer tight board tolerances and precise sealed edges on all four sides (S4S). And, since every inch of the product is usable, there's no waste. 1. Lay jamb horizontally on saw horses or a table. 2. Remove all the hardware and mask off anything you don't want stained. 3. DO NOT SAND GRAINED PF FRAMES. 4. Wipe the jamb with mineral spirits to clean any dust or residue from the surface. Allow jamb surface to dry completely before applying stain. With a clean, lint-free 24 x 24 inch cloth, softly wipe the surface until you reach your desired tone. TIP: When the rag becomes saturated with stain, re-fold to work with a less-saturated section. Be sure to use the same rag for the whole jamb. After all the stain is brushed evenly you may add finishing touches by using a small 1" to 2" brush or cotton swabs. 1. After stain has completely dried (48 hours), mix the top coat well and apply evenly using a clean dry 2" soft bristle brush or 3" foam brush. Be sure to stop when the grain changes direction. 2. Apply two or three coats of finish, allowing at least 24 hours of drying time between each application. Even a well-finished PF Frame will be affected by exposure and weathering from sun, moisture, and air pollutants. It is considered normal maintenance to re-apply the topcoat approximately every two years. Due to the variability in finishing materials, application conditions and techniques, all of which are beyond the control of Worldwide. We cannot be responsible for the performance of field applied finishes or individual application techniques. indicated are specific to the Zar Brand stain included in our stain kit. Please reference stain manufacturer`s instructions before applying any stain.